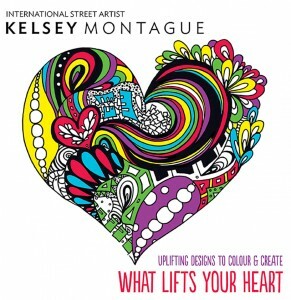 Kelsey Montague is an international street artist who believes that art should not be separated from the human experience, but that the human experience should have a hand in creating the art itself. 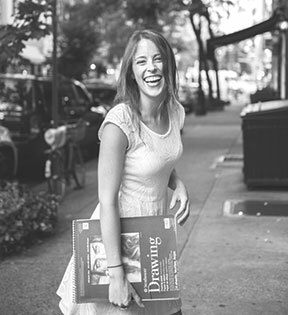 Kelsey has painted large scale, interactive street murals in six countries on three continents. Each piece has provided an opportunity for thousands of people to become living works of art. Participants are invited to step in to the artwork, explore what inspires them, and post pictures on social media under the Instagram hashtag #whatliftsyou. Kelsey’s art has been featured by the New York Times, The Wall Street Journal, Forbes, Mashable and MTV, as well as seen on the Instagram accounts of Taylor Swift and Vanessa Hudgens. 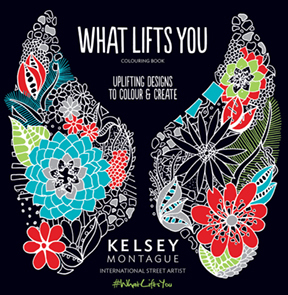 The What Lifts You colouring book is a natural outcome of Kelsey’s philosophy that creating art should be an interactive, thought-provoking and uplifting experience.